HealthAid Krill-Life Capsules are a rich source of essential Omega-3 fatty acids EPA/DHA bound to phospholipids, providing significantly greater bioavailability than other marine fish oils. Rich in natural carotenoid molecule astaxanthin with powerful antioxidant activity. It protects the omega-3 fatty acids from oxidasation. 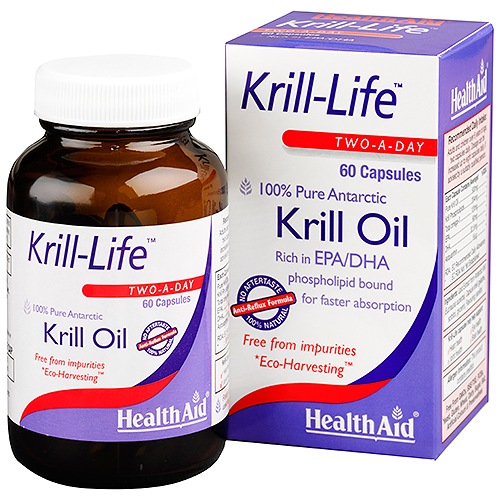 Krill oil is sustainably sourced from crustacean Krill (Euphrasia superba) in the pristine waters of Antarctic Ocean. Krill-Life Capsules offer the benefit of an anti-reflux formulation that helps eliminate unpleasant aftertaste, in a small easy to swallow red soft gel capsule. Krill-Life Capsules are free from impurities, GMOs, BSE/TSE, PCBs and are sustainably sourced and Eco-Harvested. HealthAid`s philosophy has been to provide a range of products that are carefully researched, nutritionally balanced and which help to supplement the many and varied dietary needs of the whole family. Many modern lifestyles involve an unhealthy dependence on highly refined or processed foods; hectic schedules, skipped meals, everyday stress and harmful environments which are detrimental to people’s health. HealthAid is committed to maintaining an innovative and creative approach to its products, many of which reflect the latest research in the field of nutrition and health. Lipid Extract from Antarctic Krill (Euphrasia superba), Capsule shell (gelatin, sorbitol, glycerin) ,Flavouring (vanillin). Adults and Children over 6 years of age: Take 2 capsules daily. Dosage can be increased up to eight capsules daily if advised by a suitably qualified person. Free from impurities *Eco-Harvesting™ ( *Eco-HarvestingTM is a trademark of Aker BioMarine). Below are reviews of HealthAid Krill-Life - Pure Krill Oil - 60 Capsules by bodykind customers. If you have tried this product we'd love to hear what you think so please leave a review. HealthAid Krill-Life Capsules are a rich source of essential Omega-3 fatty acids EPA/DHA bound to phospholipids, providing significantly greater bioavailability than other marine fish oils.